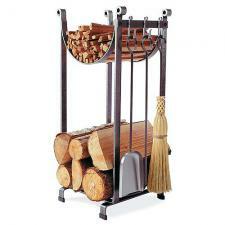 Our best-selling rack stacks a lot of firewood in just a little floor space. The kindling holder on top adds functional utility to the elegantly simple design. Fireplace tools include poker, shovel, and natural sorghum broom. Product Info:14"L X 16"W X 34"H Shipping weight: 29 lbs.